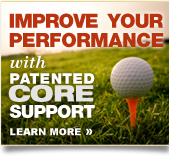 Jox™ Core Support Shorts were designed as a therapeutic undergarment for the person who wants back support and comfort. Jox™ Core Support Shorts for daily physical and athletic activities is more than a compression short attached to a back support belt. The Core Support Panel built into the front of the shorts provides a core stabilizer over the midline of the wearer. This core stabilizer assists in the proper aligning of the spine when the belt is securely fastened. The Jox™ belt is made from a unique and patented fabric which wicks moisture away from the body, is breathable, and antibacterial. The antibacterial and antimicrobial properties discourage bacterial growth and odor. The compression shorts are made of high grade spandex. They are breathable, provide enhanced circulation, assist in reducing lactic acid build up, and relax the lower body and upper leg muscles. 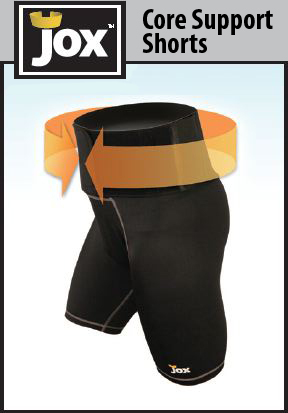 Jox™ Core Support Shorts for daily physical and athletic activities is a unique product. The posterior mid transverse section of the belt supports the L4 , L5, and lumbosacrel aspects of the spinal column, providing a strong-hinge like effect for the upper torso, reinforcing support at the axis of rotation. This structural support provides extra support for fatigued or weak muscles. Jox™ Core Support Shorts have been designed to provide extra support for static and dynamic activities that require extension and rotation. In fact, clinical trials showed a 19% decrease in pressure on the lower back among subjects who wore Jox™ Core Support Shorts versus those who did not. 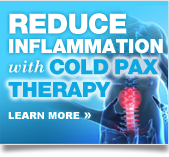 Jox™ Core Support Shorts for daily physical and athletic activities is the only garment that provides back and core support with therapeutic hot and cold treatment capabilities. 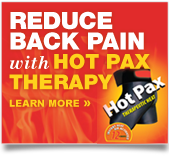 On the inside of the core supporting belt is a pouch to accommodate our instant Jox™ Hot and Cold Pax™.